Balvenie Single Barrel aged for 12 years, exclusively in a first fill Bourbon barrel imported from America. Each bottle of Single Malt bears the handwritten number of the cask where it has aged. 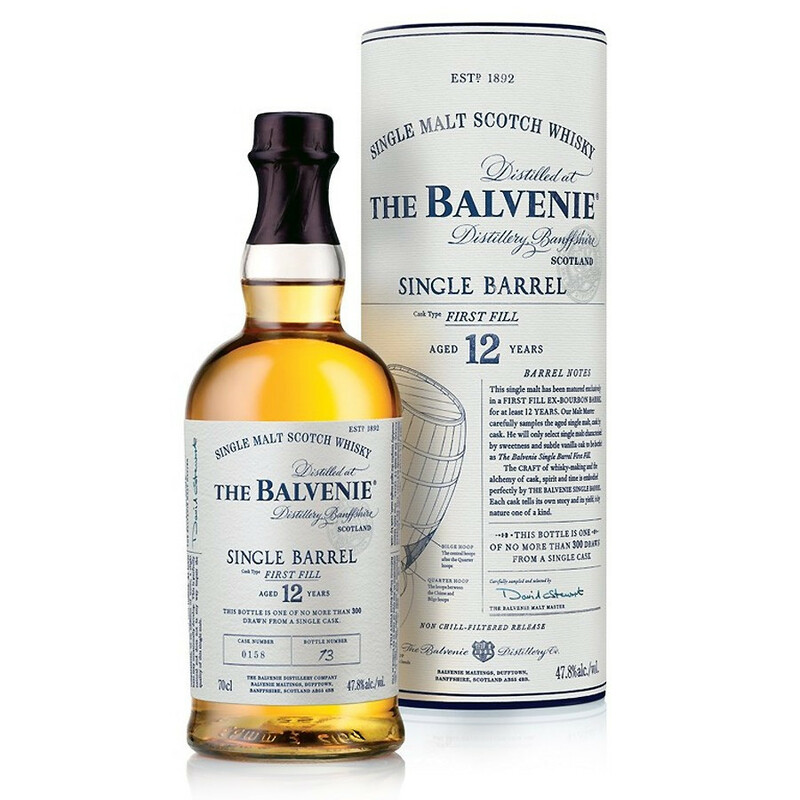 If each version has its very own taste, all of them develop this characteristic aromatic richness and unbelievable sweetness lifted by a honeyed vanilla touch, typical of The Balvenie. The oak barrels bring typical spicy vanilla notes, with a lovely, lasting sweetness. The Balvenie is a small distillery nestled in the Scottish Highlands, at the heart of the land of whisky: Speyside. The Balvenie is a real museum, as nothing changed much since its establishment in 1892. Its name derives from the Balvenie castle (13th century), located a few hundred yards away. Since 1892, it has been family-owned and family-run. This independence allows the distillery to focus exclusively on the production of traditional craft Single Malts. The name “Balvenie” is a mystery in itself. If “Bal” means house or farm in Gaelic, the meaning of “Venie” has been lost. The Balvenie is proud to be one of the last four distilleries of the Highlands to use a traditional malting area. Four maltmen turn the malt three times a day, seven days a week, to even out the germination. The nine stills are placed under the close surveillance of a skilled blacksmith. In order to keep all of the character of The Balvenie Single Malts, the stills in used today are the exact replica of the originals. Until today, the oak casks are crafted by coopers, continuing the traditions and maintaining the skills alive as an heritage of ancient craftsmanship. Nose: rich, complex, with deep notes of vanilla oak. Palate: notes of sweet fruits and subtle spices, layered on honey touches.